Love chicken, but not long ingredient lists? You're so lucky... or should we say clucky? Each of these tasty new recipes has just five ingredients or less (not including basic spices, of course). In a slow cooker, combine tomatoes, vinegar, 2 tsp. garlic powder, 1 tsp. oregano, and 1 tsp. basil. Mix until uniform. Season chicken with 1/4 tsp. each salt and black pepper, and add to the slow cooker. Add green beans, and mix well. Cover and cook on high for 3 - 4 hours or on low for 7 - 8 hours, until chicken is cooked through and green beans are tender. Turn off slow cooker, and transfer chicken to a cutting board. Roughly chop, and return to the slow cooker. Stir in spinach, re-cover, and let sit for 5 minutes, or until spinach has wilted. This is kind of like spanakopita, but with chicken instead of dough... In other words, perfection. 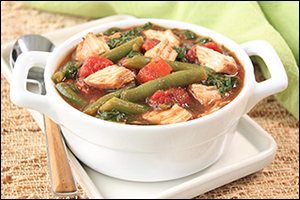 In a medium microwave-safe bowl, microwave spinach for 30 seconds, or until wilted. Blot away excess moisture. Add feta and garlic, and mix well. Season chicken cutlets with 1/8 tsp. each salt and black pepper. 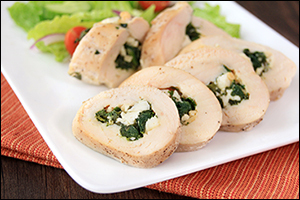 Evenly divide spinach-feta mixture between the centers of the cutlets. Roll up each chicken cutlet over the mixture. If needed, secure with toothpicks. Place in the baking pan. Remove foil. Bake until chicken is cooked through, about 20 more minutes. Hungry for More Easy Chicken Recipes?